How do you resharpen Iron Will Broadheads? We have videos posted on our YouTube channel showing light touch ups and thorough resharpening. We also sell a two-sided sharpening stone and just added a video showing how to use it. Click here to see our videos on YouTube. Are the blade sizes all the same? Except for the s100 blade which only works with the s100 ferrule, the blades are all the same size and are interchangeable (1 1/16" Main Blade & 3/4" Bleeder). The S-Series (solid) blades can be swapped with the V-Series (vented) blades, but this adds 25 grains (v100 becomes the s125). Check the videos on our YouTube channel for assembly/disassembly and alignment if removing blades. How long will my broadheads take to ship? All products are now shipping within 1-2 business days after ordering, except for the k1 knives and the s100 broadheads. We are shipping s100 preorders now and new orders will take 1-2 weeks to ship. k1 knives will ship in late April. If I choose next day shipping, will I get them the next day? No, but we will ship your order by next day air when it is ready to ship. A2 steel has less corrosion resistance than stainless steel. It has 5% chromium, so a good amount of corrosion resistance, but not the >13% chromium of SS. The benefit is that it has far superior mechanical properties when both high hardness (edge sharpness & edge retention) and high impact strength are needed. We did laboratory salt spray testing to industry standards and found that A2 performed similar to 420SS in the number of days before damaging corrosion (pitting) occurred, but surface spots do show up sooner. After five days in a wet quiver, we've found these spots to be just at the surface and can be easily removed with a plastic scraper, Scotchbrite pad or metal polish with no damage to the base metal. The factory puts a light coat of food grade (oderless) mineral oil on the blades. This can be re-applied with use to further improve corrosion resistance. How do you remove the blades for replacement? Remove the screw using a T6 Torx driver, then pull the main blade straight out the end followed by the bleeder blade out the side. 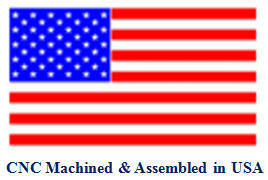 See the assembly/disassembly instructions on our YouTube channel for assembly and blade alignment. Click here to see our videos on YouTube.